Bollywood actress and former Miss World Aishwarya Rai Bachchan is one of the most beautiful women in the world. The actress has always left her fans mesmerised with her natural beauty. 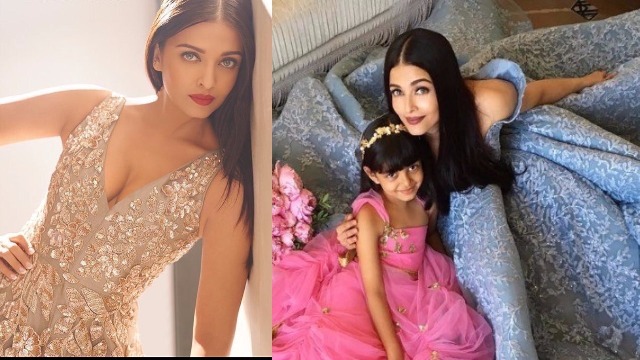 From being a diva to a wonderful wife and mom, Aishwarya Rai Bachchan has turned 44 today. She is undoubtedly an example of balancing personal and professional life at a time. For her birthday, the actress has preferred to have a simple celebration with family. Reports suggest that Abhishek Bachchan and daughter Aaradhya Bachchan have a surprise planned for the birthday girl. They have ordered a cake and will be celebrating Aish’s birthday at the family get-together in the evening. First commercial ad: Did you know Aishwarya Rai made her first TV debut with a commercial ad? Yes, Aish did her first commercial ad for Camlin pencils when she was still studying in school 9th. Later, at the age of 17 she rose to fame through Pepsi and the Garden sari ads. First Bollywood actress put on display in London’s Madame Tussaud’s wax museum: She definitely one of the kind! She is the first Bollywood actress who got her wax statue at Madame Tussaud’s in London. It’s surely not a cake walk! After her father-in-law, Amitabh Bachchan, she is is the only Bollywood celebrity to receive this honor in 2004. Oprah Winfrey show: She has pinned India on a global map the right way by presenting herself and her work at international platforms! Ash was also the first Indian actress to have appeared on the famous Oprah Winfrey show in the US. A doctor or an Architect: Little did anyone know that Aishwarya wanted to pursue her career in medicine during her school days. However, she got enrolled in a college in Mumbai for pursuing her career in architect but left it and went on to become Miss World in 1997. Padma Shri Awardee: There have been numerous times in Aishwarya’s life where she made herself and family stood proudly. She was awarded the Padma Shri in 2009 by the Government of India and received ‘Ordre des Arts et des Letters’ by the Government of France in 2012. Globally Popular: Indian’s pride Aishwarya Rai Bachchan was the only Indian actress who was invited for lunch by former US President George Bush in 2006. Cannes Jury: She owns Cannes! Aish was the first Indian to be on the chair of a jury member of the Cannes Film festival, representing India. Next : Shah Rukh Khan’s 52nd Birthday: Alia Bhatt, Katrina, Deepika Padukone Party At Alibaug!